The lakes are finally frozen and walleye ice season is upon us. It is time to start thinking about how you can put more walleyes on the ice this year. One tactic that has been around for a long time is the use of spoons. Here is a little review of some of the trusty standbys and some new players to the game. The Northland macho minnow has been responsible for putting many master angler walleyes on the ice over the years. There are six standard colors and six hi-vis UV colors. The most popular size is usually the ¼ oz. There are a few special features that make this spoon special. This lure comes with a metal kicker-tail fin that flickers, flashes, kicks and clatters to lure fish in. The other thing is the way the metal of this lure is cut. The lure has a beveled design that creates an erratic tumbling action on the fall. A new player to the market this year is the Glo Shot Spoon. Northland took the Buckshot Flutter Spoon, which was a big hit a few years ago, removed the rattles and replaced them with a slot for a mini glo stick. The lure comes in 12 colors (four metallic, four UV and four glow). The glow sticks last all day and also come in a variety of colors. Make some noise with rattle spoons. Probably the most popular rattle spoon of all time is the Buck-Shot Rattle Spoon. It is one of the noisiest minnow imitating jigging spoons around. I have had luck using all sizes – from ¼ oz up to ¾ oz. There are a total of 10 standard colors, four with a metallic back and six with a super-glo painted back. 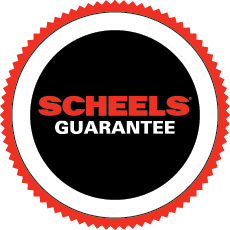 Besides the standard colors, Scheels also has over a dozen exclusive fish catching colors in the 1/16 oz and 1/8 oz sizes. Larger flutter spoons have found their way into the walleye world the past few seasons. These larger spoons measure 3 inches to 4 inches in length. Typically they are lighter and have a lot more fluttering action on the fall. The past two seasons I have been using the Northland Buck-Shot Flutter Spoons in 7/8 oz size. These spoons measure 3 ½ inches. They offer a much larger profile and a lot more vibration and flash. The walleyes just slurp these spoons up like a piece of pickled herring during the holidays. When I am fishing for walleyes, I usually like to tip my smaller size spoons with a minnow head. I like to use a small piece of rubber or plastic to help keep the bait on the hook, especially if the regulations require barbless hooks (pinched down barbs). I used to use a small piece of rubber band. However, a few years ago Northland came out with the Impulse Minnow Head. It is designed to look like a real head and is infused with Impulse attractant. I place the Impulse Minnow Head on after the real minnow head. The Impulse plastic sticks really well to the hooks. If I lose the real head, I still have the Impulse one to entice the next bite. On the larger spoons I not only use minnow heads, but often you can use two to three whole fathead or shiner minnows wrapped onto the hooks. Use a snap swivel when attaching spoons to the line. The reason I use a snap swivel instead of a simple snap is that spoons often twist and turn when fished. The swivel portion helps to eliminate twists in your line. It is also an option to place a small swivel in line two to three feet above the spoon. Use a little heavier and stiffer leader material. Two to three feet of 15 lb test fluorocarbon is ideal. This line is a little stiffer, and it helps keep the hooks from the spoon from catching on the main line when the lure is on the fall. Fishing with these lures, I usually have two different actions to impart on the lure. The first one is a simple lift and drop. I will lift the lure two feet or so and then let the spoon flutter back down to its resting point. Keep repeating. The bite usually comes on the fall, and you feel it when you are ready to start your next lift. The other thing I do with these lures is to basically hold it steady but shake it. This makes the minnow head or impulse minnow head rock and shake back and forth. This is a very good way to make the walleyes commit once you have their attention looking at your spoon.